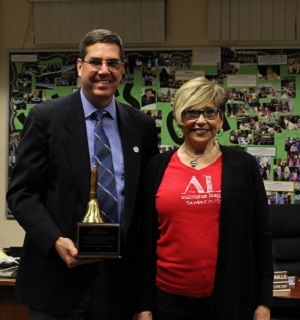 On the evening of February 21, 2018, it was a wonderful privilege for Assistance League of Santa Clarita to present the National Operation School Bell® Award to the Board of Trustees of the Sulphur Springs Union School District. Working with this school district, it was determined some families may lack the means of transportation to the Old Navy Store that partners with our chapter for Operation School Bell. The school principals worked together and were able to provide school buses and hired drivers to bring families to the store. The participation from this district increased vastly because of this effort. New school clothing and shoes were given to approximately 430 children. The evening was a wonderful celebration of success. Our President, Linda Likins, presented the award to Mr. Ken Chase, School Board President, at the monthly board meeting. She spoke of the efforts made, and the increased participation from the Sulphur Springs families. She explained that this award is infrequently presented. About thirty of our members were in attendance to say thank you to the trustees. We brought a large decorated cake that was enjoyed by everyone attending this celebration of our wonderful philanthropic program, Operation School Bell.